beer can with morphs to crumble and crush it. savanna (1 year ago) Inappropriate? thank you! 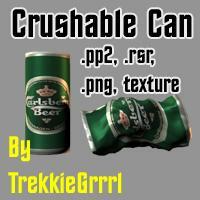 crushable is good! Skal! Thx Trekkiegrrl and welcome back! I needed one, and you delivered! Thank you! thomasishp (5 years ago) Inappropriate? Looks cool, but the texture map seems to still be missing. Trekkiegrrrl (8 years ago) Inappropriate? montag58 (9 years ago) Inappropriate? Thish onesh a keeper; thanksh! I remember Carlesberg beer. I think I drank that before I upgraded to Miller Highlife. thanks for this alleyway detritus. KnochenKater (10 years ago) Inappropriate? Yes, unfortunately the texture is missing, but nevertheless thanks for this useable freebie! I made my own texture for it. It;s sad that the texture map is missing :( It's such a great usefull thing!